I am useless at any kind of synchronised activity. When I do an aerobics class, you can be sure that at some stage I will be going left, when everyone else is going right. Let's not even start the discussion about synchronised dancing. I have some kind of mental block, that transmits itself to my feet and 'boom' I'm out of sync! I remembered this today, because I recently came across a quote that made me go "hmmm". Pastor Joel Osteen said "you are not defined by your past, you are prepared by it"
When I left Nigeria, many moons ago, I did so, because I never felt like I properly belonged. It felt like I had to constantly change who I was, in order to fit in. Living in Nigeria was bad for my soul, so I got out of Dodge as quickly as I could. A funny thing has happened though. All the experiences I had, including the most painful ones have gone into making me the life coach I am today. I'm not who I am in spite of what happened, I am who I am because of what happened. Was it fun going through those experiences? No siree. Am I stronger as a result? Yes. Can I empathise with the women I work with? Absolutely. I have made some scarily bad decisions in my life, but I'm still standing and willing to extend a hand to any other woman who needs my help. I'd also like to say that contrary to what we believe, the past has no power over us, except the power we give it. I can hear some of you saying "how can you say that? You don't know what I've been through". And you're right, I may not have been through, what you've been through. But what I do know is that a lot of us have given the past a power over us that it doesn't deserve. We give the past power over us, when we constantly rehearse it to ourselves and other people. Hands up all of you, who know someone who can tell you the story of how someone did them wrong, last month, last year or 10 years ago! We also give the past power, when we can't or won't forgive those who have hurt us. Most of us have it all wrong when we think about forgiveness. We think by forgiving someone, we are condoning their behaviour or letting them off the hook. No my friends, when we forgive, we are letting ourselves off the hook, we are setting ourselves free. When we don't forgive, it's like sending ourselves to prison. The wrongdoer is going on their own sweet way, while we're dealing with high blood pressure, depression and heart attacks. There's something very wrong with that picture I think. I don't know about you, but I'd certainly rather be free to get on with my life, success being the best kind of revenge. Finally, I'd say, learn the lessons from the past and let them be a springboard for a brighter future. Do you remember the ads in the back of the newspapers for some exercise gizmo, that could turn a weakling into Charles Atlas? Said weakling kept getting sand kicked in his face at the beach, because he looked so weedy. So he goes off and gets this contraption, bulks up and no-one kicks sand in his face anymore! My point? He didn't just accept what had happened, he got up and did something about it. A lot of us are not living our best lives, because we are trapped in the past. We say things like "I failed before, so I'm sure I'll fail again" or "I'm not qualified to do this, because I've made such a mess of my own life". What I say, is that it's precisely because of your failings and imperfections that your successes are more credible. Would you rather take debt advice from a person, who's never overspent in their life or from someone who's crawled back from financial ruin- having learned some very hard lessons along the way and become much wiser? I know who I'd be more inclined to listen to! So, back to me and my abysmal synchronised exercise skills. I'm pleased to say that I exercise and dance regularly- sometimes I get excited and do them both together. I've learned though that exercise classes are not for me and if trying to keep up with a routine is going to drive me crazy, then it's best to make them a solo pursuit. My takeaway this week is don't be defined by your past, instead let it prepare you, to start living your best life. born2bebeautiful is taking a well deserved break over the summer, so see you in August. I fear that I have made a rod for my own back. 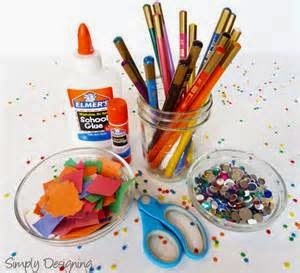 I bought my 3 year old an activity box recently and it wasn't until her hot little hands had ripped off the wrapper, that I realised that she will need my help to make even the simplest piece! Given the fact that I once put together a CD rack, lifted it up and the back fell off, you can only imagine my dread at the idea of an activity box. Once I realised that I was not going to be able to escape this, I promptly looked for the easiest thing to make, which turned out to be a mask. 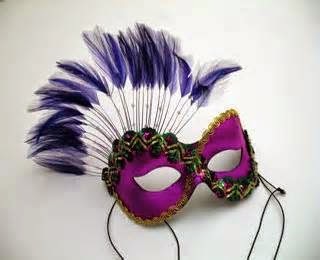 One generous blob of purple glitter glue, a pompom and 2 googly eyes later and hey presto, we had a rather fetching mask. I remembered our adventure as I read a quote by Nathaniel Hawthorne, where he says "no man for any considerable period, can wear one face to himself and another to the multitude, without finally getting bewildered, as to which one may be the true one..." Although my 3 year old seems to be surgically attached to her mask, underneath, she's still the same as she's always been. However, it's a bit different for grown ups. As grown ups, we usually have a variety of masks for a variety of reasons. There's the "I don't want to be hurt, so here's my hard nut" mask. There's the "I want to be loved so desperately, that I will be anything you want me to be" mask. And then, there's the all purpose " you wouldn't like me, if you knew the real me, so I'm just going to be someone else" mask. There's a common thread that runs through all these masks though and that thread is self protection. No-one wants to be hurt, so we so what we can to avoid it and sometimes that means donning a mask or two. It's a problem though, when we can no longer tell who the real us is anymore. When we do such a great job of putting our masks on that other people don't recognise us anymore. It's a bit like a method actor, who forgets it's just a character and starts to believe that they are who they are portraying. Wearing a mask only leads to confusion, ours and other peoples! Lastly, masks, don't even do what you want them to. We put them on to protect us from hurt, but they can't actually do that. No matter what mask we put on, if someone violates one of our core values, it's going to hurt. Imagine this scenario: you're wearing your best "I'm not really interested in you" mask. And then you discover that your significant other is quite the man about town and he's not just holding hands, if you know what I mean. Chances are you wanted a committed relationship, but didn't want to come across as being too keen. He on the other hand, took your mask to mean you didn't mind him stepping out on you, all over town. You can see how wearing that mask has led to a world of hurt and confusion. What's the alternative I hear you ask? Can I really live without my masks? My answer to both those questions is yes. Will you feel vulnerable? Yes. Will it be scary? Without a doubt. Will it be worth it? Absolutely. Authenticity is the best gift you can give yourself and the people around you. Speaking your truth, gives other people, the opportunity to speak theirs too. Being authentic is the answer to the confusion caused by wearing a mask. So this week, I'm setting a challenge for me as well as for you. Take off the mask. If that feels too scary, be like my daughter and wear it for short periods of time, until you can do without it completely. Living authentically, is the first step towards living your best life and who doesn't want that? Who is Godot and when will he be here? I must confess I'm not a theatre kind of girl. I love movies and sometimes the trashier the better (Terminator anyone?). A couple of years ago, I went to watch a play called 'Waiting for Godot'. The person I went with, swore it was a masterpiece. I believe the word 'existential' was used, but I've erased the incident from my mind, so I can't be sure. Well, I went, I don't know about existential, but I was bored silly. I feel asleep and when I woke up, he still hadn't arrived. My question was "who is Godot and where on earth is he????? This week's post is about waiting and the value in waiting. 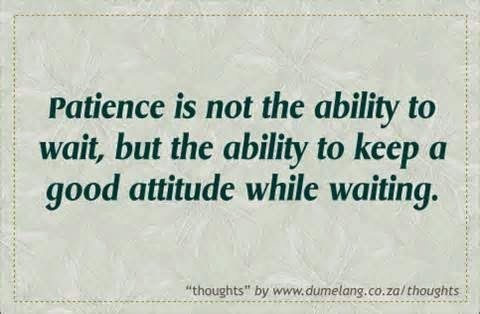 Waiting is something that most of us don't like to do and most of us don't do it gracefully at all. But there is value in waiting and life would be so much less frustrating, if we learned to wait well. The main value in waiting is the character it has the potential to produce in you. I say 'potential' because you can decide not to allow it to produce anything except frustration and anger. When I decided to set up my own business, unusually, I wrote things down. Not quite a business plan, but certainly much more structured than I usually am. In my head, I think I felt that because of my super duper plan, it would all fall into place and I wouldn't have to wait very long, for the business to take off like I wanted. Well, it's 2 years later and whilst it's a work in progress, it has been painfully slow. I have been through the whole gamut of frustration, anger and depression, but now, I'm out on the other side. The side, where I have decided to be as resourceful as I can be, whilst I continue to grow the business. There are things that I have discovered that I can do, that I would never have found out, if I wasn't waiting. Is there something you're waiting for that's taking a lot longer than you thought? How are you waiting? Resourcefully or in a state of serious frustration? If your answer to my questions is serious frustration, then may I offer you a piece of advice? 'don't just wait, do something'. When most people think about waiting, the picture that comes to mind is just passively, sitting on your hands, waiting for something to happen. My advice? Don't do that because it's guaranteed to add to your feeling of a lack of control. Use the waiting time productively. Are there some skills you need to take you to the next level? Take a course, read a book, attend a seminar, do some research. Need some hands on experience? How about volunteering. I've had a couple of volunteering gigs and they both helped me to develop new skills and hone existing ones. Finally, whilst you wait, don't forget to breathe. A lot of us hold our breath, whilst we're waiting. What do I mean by that? I mean, we say things like: when I get that job, when my business takes off, when I meet that life partner, when I lose 20 pounds, then I'll.... I hope that you get all that you are waiting for, but don't put your life on hold in the meantime. What happens if it takes longer than you expected? Planning is great, but being flexible is a great trait to have. Sometimes, the waiting time is just what you need, to help you break through to that next level. But even if it won't, don't just struggle along. Get up, get out, have great adventures, create the world you want to see. I don't know about you, but I've decided to focus on the things I already have, rather than fret about the things I'm still waiting for and I'd like to encourage you to do the same. 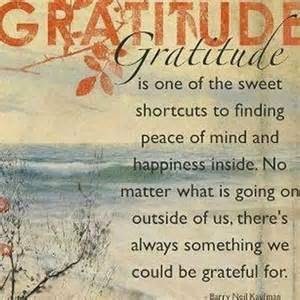 Gratitude is a very powerful thing and it can really transform your waiting period.